Normally after a break, I'd be inclined to say that 'Doctor Who' has made a "welcome return". Not this time. The first half of series 7 (or series 33, depending on your chosen classification) was largely mediocre, although last year's Christmas special hinted at improvement. Indeed, it transpires that 'The Bells Of Saint John is a welcome return. Spoilers below. I'm not a massive fan of blatant exposition but the opening to 'The Bells Of Saint John' handles it in an impressive manner - revealing that the unknown man explaining how people's souls were being uploaded on the internet had himself been ensnared by the the wi-fi connection he warned of. Meanwhile, The Doctor (Matt Smith) is being a mopey monk in 1207 before suddenly getting a phonecall. As you do. This phonecall reunites Clara (Jenna-Louise Coleman) with The Doctor, having received the number to the TARDIS from "the woman in the shop" - presumably River Song. Although hopefully not because I really do not enjoy Alex Kingston in 'Doctor Who'. Anyway, Clara finds herself caught in the wi-fi, only to have The Doctor come to her rescue. Thankfully, Clara proves adept at least occasionally - of course, she's already proved her worth in Christmas special 'The Snowmen', and series opener 'The Asylum Of Daleks'. But there are few worse failures than having a meek female lead character. Speaking of which, Celia Imrie does a terrific job as the director of the internet bad guys. The Doctor's method of defeating his foes pleasantly took me by surprise - the use of one of the walking base stations and an anti-gravity bike both clever and enjoyable. Although the way Clara found out that the bad guys were in The Shard was a bit suspect, to say the least - although I enjoyed the knowingly dated line about Bebo and Habbo. The revelation of Richard E Grant's character from 'The Snowmen' being the person/"Great Intelligence" behind the villainy was less of a pleasant surprise but I'm happy to see where they go from here. The final line of the episode certainly teased us as The Doctor queried why there was a leaf in Clara's 101 Places To See book: "That wasn't a leaf, that was page one". Probably a reference to their meeting in the prequel (embedded above)? Not that is much more help. 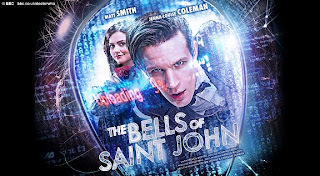 'The Bells Of Saint John' might have felt overly reminiscent of Charlie Brooker's 'Black Mirror' series, with its statements on the consuming nature of modern day technology, yet it retained the witty identity of contemporary 'Doctor Who'. Writer Steven Moffat has becoming increasingly hit-and-miss but this was much more of a hit, especially with the slew of in-jokes and references, including the delightful "Earl's Court was an embarrassment". 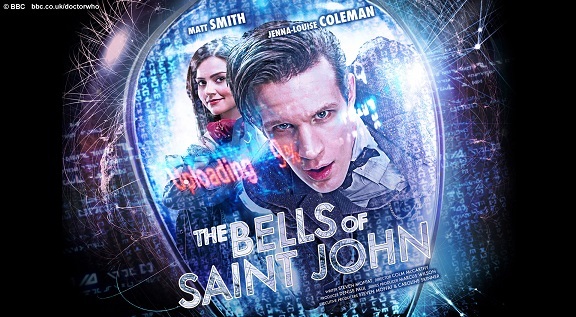 Watch 'The Bells Of Saint John' at BBC iPlayer for a limited time.